I will be speaking this year at 360 Flex in Denver, Colorado. 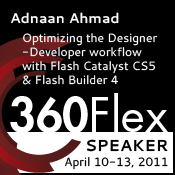 The subject of discussion will be Designer/Developer Work-flow in Adobe Flash Catalyst. If you are interested in attending you can use the code speakerfriend2011 to save 20% on the price of admission.